I have purchased and used these cap nuts and the bolts that go with them many times. They are well made and substantial in their application. I would recommend using this hardware to others. Great product. I have used them before in various projects. It makes it easier to build a large project, like an Entertainment center, in two pieces and re-assemble it on site later on. Excellent way to fasten wooden parts and still be decorative. I use these with the bolts that match . The bolts use a 4 mm hex tool to tighten them and these use a 5 mm hex. They add a lot to a project that needs to be taken apart at some point as the one I am working on . Great find for what I had been searching for. Perfect solution for my outdoor teak furniture. I ENLARGED & RECONSTRUCTED A WALL UNIT THAT HAD BELONGED TO MY FATHER IN LAW. I USED THE CONNECTOR BOLTS AND CAP NUTS TO FASTEN THE PIECES TOGETHER. THEY WORKED GREAT & LOOK GOOD WHERE THEY ARE VISIBLE! 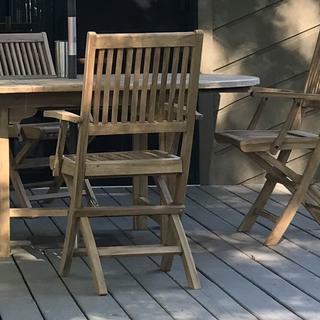 Used to repair arms and legs on folding Teak Deck Chairs. I've never used these sets before, but they are exactly what I needed for my homemade project! Not only are they functional in use, the viable black heads are a great visual addition to the overall look of my "creation." Well made and good threads. 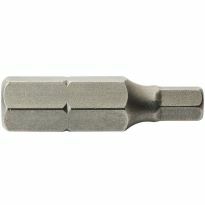 Used in several knock-apart projects and for sliding in slots. 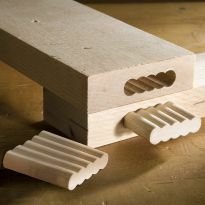 These connectors are perfect for knockdown furniture. Wood magazine project called for these. I had never used them before but they worked great. When screws don't work. This is the way! Used these to put together a bunk bed that I wanted to be able to disassemble. Very easy to use and holds tight. Will consider using these again. Superb, neat , trick,inconspicuous. I pulled together a 75 yr old heavy porch swing with the cap nuts & 1/4-20 threaded rod. 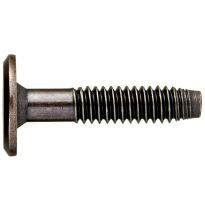 Exceleant heavy duty product to replace the light weight aluminum &quot;Chicago screw posts&quot; on our plan holders. Used on my deck furniture to replace cap nuts that were failing. The cap nuts are much more solid then ones being replaced. Ended up replacing all the cap nuts on the furniture due to the cap nut product quality. These are very hard to find in small size (1 inch). They are what I need to repair a chair. Thanks. These worked fine for my purposes, but out of the two packages (8-per package) one of the cap nuts required a different size allen wrench than the others. As with connector bolt review; would be nice to have smaller diameter head option available. This product is integral to my WaCru DSLR Cage! im building a beer box ice chest and i use these fasteners to the lid. Like to use them to make cabinet hardware! building a plat form bed. for the appearance of the assembled chair, flat head will look great. I am replacing lost parts to our bunk bed. This is the only place I could locate the correct parts. I had to replace them for my daughter's crib after a moving company lost the originals that came with the crib. It's perfect for the connector challenge I'm faced. It's also the first time I've found them so readily and so inexpensive. needed for other end of connector bolt. To fix some doors at church. Hidden connector for new tray tables. I have used the caps and bolts on other projects. I found them easy to install and easy to take my projects apart. To go with the bolts he also bought to build the bed frame from the plans in his wood magazine. Needed replacement parts for baby crib. It looks exactly like the part, so I'm hoping it works. Appropriate for project I am working on. I hope this is the correct item. it is hard to tell if this is correct part. Couldn't find the right bolt at Home Depot. This one looks like the right one. Fingers crossed. What I needed to finish my project. Connecting two 3/4" cabinet cases together. These were exactly what I needed to assemble a homemade privacy screen using reclaimed wood and copper pipe. 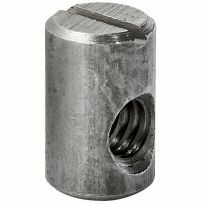 Will 1 1/8 bolt and cap nut work to bolt two 3/4 inch wood pieces (1 1/2 inch thick)? Will 5/16 inch engagement be enough? what size hole do you need for the cap? I have wood total thickness is 1-1/2 what do I need to connect it together ?? Are there varying sized of these nut caps? Do you have suggestions where else to look? BEST ANSWER: Yes, the connector bolts and cap nuts are metal. can i use this with 1/4 #20 threaded rod? BEST ANSWER: Yes=I have used these cap nuts with 1/4 #20 threaded rods on more than one occasion-screw cap nut onto one end of threaded rod, mark rod with a piece of tape, unscrew cap nut = in order to show yourself the correct length of rod up into cap nut = this will ensure you cut the threaded rod to the correct length. Good Luck! I don't have any left to check thread pitch. Sorry. 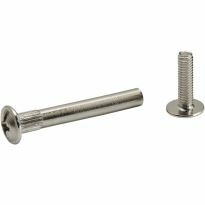 I want to use these bolts and cap nuts to join the side panel of a murphy bed to the adjacent side panel of a set of shelves. Basically joining 2 - 3/4" plywood panels face to face. I'm not sure if the tapered end of the 1 1/8" bolt will reduce the thread engagement at the tip. 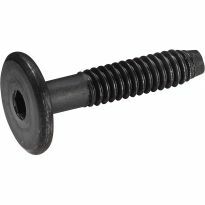 Can I reach 1 1/2 inches with the 1 1/8" bolt and cap nuts, or will I need to cut down a 2" bolt? BEST ANSWER: I had a similar issue and ultimately used longer bolts and cut them to the desired length. Thanks Roger. I was thinking that I might need to cut down the longer bolts. Although it's a bit more effort I expect I'll get much better thread engagement. Your input is much appreciated. You are good to go with 1 1/8"
I'm wanting to connect a vintage wood headboard and foot board to some shelving units to create a platform bed. The shelving units are made of particle board. The shelving units and bolts will be holding the headboard and foot board upright. The four shelving units will be supporting the bed slats and distributed weight of the mattress and people, but the bolts won't be supporting that weight. I'm thinking of putting two bolts at each joint, one above the other. Do I need to do something to reinforce the particle board at the joints? Do I really need two bolts at each joint? Thanks, Leo. I think the particle board is the 3/4 inch kind. Best wishes to you! 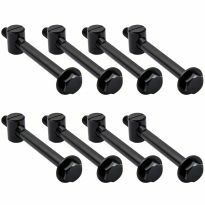 are the black oxide connector bolts suitable for exterior conditions ? BEST ANSWER: I would not use these outdoors. You could paint them with rustoleum or something equivalent. 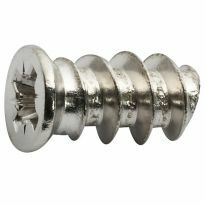 Do the Cap Nuts have to be epoxied in place to prevent 'spinning'? BEST ANSWER: I used these for a wood panel I wanted to be able to remove easily. I did not secure these connector bolts with any adhesive and they seem to tighten easily by holding the back side with my hand until they pull tight. After they tighten up they don't slip. To remove I sometimes have to put a little pressure on the back with my hand but generally they just unscrew without much trouble. Note that I am securing two pieces of wood for materials that may be very hard I don't know if they would slip. Also, I have easy access to both sides which makes it convenient to put pressure on the back side if needed. What is the thread depth of these nuts? BEST ANSWER: Good evening,History of use: I use Cap Nuts as splice bolts for joining cabinets together with the intent of being able to take the units apart if they have to be relocated. To answer your question, I usually join two three quarter inch sections of plywood (panels) together for most of my cabinet work. Keep in mind when selecting Cap Nuts, you must determine the thickness of the material you are going join together, this determines the length of the nuts as well as thread length. As I have pointed out, I usually bond two three quarter inch sections together therefore, the threaded section is approximately five eights of an inch in depth. 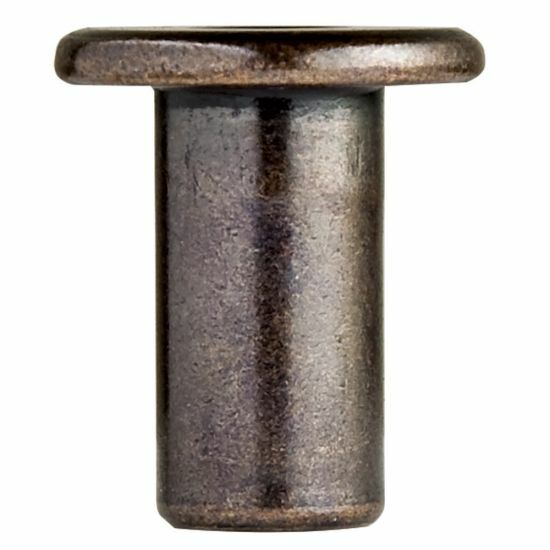 One additional thing I need to point out is one Cap Nut section (female) is larger in diameter then the (male) Cap Nut section, therefore, when drilling the pilot holes you need to take this into consideration. I usually use a “Hole Templet Sizing Tool” to choose my drill bit. Selection of which side of the panel for the larger pilot hole doesn’t matter as long as the mating hole (opposite hole (male)) is slightly smaller. As a reminder, the thread depth is determined by the length of the Cap Nuts, you choose. One note that may help you, I use a fostener bit, to make a slight recessed hole on both surfaces for the head of the Cap Nut, in order to be flush with the panel surface. Makes nice detail work and illustrates your professionalism in wood working. I hope this helps. Black oxide - I want to use them on a exterior handrail. Some people used these on exterior furniture, did it rust on you at all? One person suggested spray painting them, but that adds a lot of labor on 100 fasteners. Thanks!